When Chris isn’t making wine or running experiments in the lab, you’ll find him meeting with wine bloggers or sending off samples to wine reviewers and wine competitions. 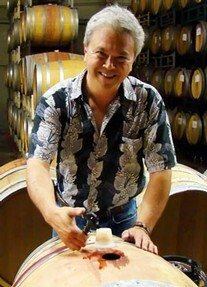 It’s time well spent since his wine has been featured in Wine Enthusiast and Tasting Panel magazines and won numerous awards at international competitions, including Sweepstakes for the best red wine at the Long Beach Grand Cru, a Double-Gold Award at the San Francisco International Wine Competition, and a Platinum Award at the Sommelier Challenge. Our Inaugural "Idyllwild Deer Sightings" label project. This label is "Winter Midnight" painted by Karlis Dabols. This medium bodied, refreshing Cabernet Sauvignon is very typical of wine you would expect from the Santa Ynez Valley. Our Inaugural "Idyllwild Deer Sightings" label project. This label is "Jazzy" painted by Rachel Welch. This medium bodied, refreshing Cabernet Sauvignon is very typical of wine you would expect from the Santa Ynez Valley. Our Inaugural "Idyllwild Deer Sightings" label project. This label is "Rocky" painted by Neil Jenkins & Donna Elliot. This medium bodied, refreshing Cabernet Sauvignon is very typical of wine you would expect from the Santa Ynez Valley. Earthy aromas of herbes de Provence, smoke and boysenberry with smooth, mouth-coating tannins. Get your very own Middle Ridge Winery LOGO GLASSES. These beauties are 100% German Lead-Free crystal that can support up to 15-1/4 ounces and have our logo and formal tag line.